The History Girls: Tiree - an historical gem. This month's post comes live from the island of Tiree in the Inner Hebrides. We arrived a week ago, inside a drizzling cloud. At first sight, Tiree was a little underwhelming - it is very flat, and I am a lover of hills. Beside the grandeur of Skye, the mountainous beauty of Harris or Jura or Mull, this pancake of an island seemed a little low. But the sun came out, and this island's beauty revealed itself in colour. The wild flowers are thick in the fertile soil. The beaches are unbelievable; the Atlantic's fury has crushed rocks into a powdery white sand. The sea in the island's bays is a startling turquoise. Up on the tiny hill we climbed, the heather was riotous and purple. The skies, I'm told, are dark and thronged with stars. I have not seen the dark, collapsing into bed early after days of surfing, walking, snorkelling, beach-combing and child wrestling. And there is history. History everywhere. Yesterday's walk. Traigh nan Gilean. I can't love a place without a sense of its past. My second novel, The Winter Isles, was set in these seas. The book is about Somerled, the first Lord of the Isles and the twelfth century world in which he lived - a maelstrom of clashing cultures: viking, gaelic and Norman. 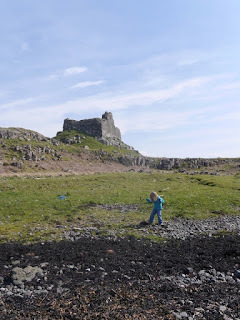 To get to Tiree, we sailed up the Sound of Mull and I saw the ruined castle at Ardtornish on the Ardnamurchan Peninsula which is said to be his stronghold. We clambered over those ruins five or so years ago, before my littlest child was born. Tiree was part of the tussles between the Lords of the Isles and local war clans. But its history is older by far. Worked flints found on the sea-shore are evidence of early hunter gatherers here, about 7,500 years ago. Tiree is also home to the famous Ringing Stone. This huge boulder seems to have been brought over from nearby Rhum and propped up. When you hit the stone it makes a ringing sound - hence the name. The stone is covered in circular indentations called cup marks, which are prevelant in early Scottish rock art. Archeaologists are not sure of their significance to their Bronze age makers, but the hypothesis is that they are religious in intent. Each of the high points of the island has its own crumbled iron age fort - there are twenty on the island dating from around 500 BC. They look to the sea, and to each other. Easy to imagine the eyes scouring the dark waves, and the beacon fires laid ready to light. Only one of these has been properly excavated, and shards of pottery which pre-dated the brochs were found. In about 800 BC, then, pottery and tools were being used. Christianity came to the island early - St Columba brought the new religion from Ireland in the sixth Century, and established the centre of the Celtic Church in Iona - a beautiful island just across the water from Tiree. A monastery was built on Tiree not long after. There is more to tell, so much more. About crofters and landlords and emigration. About Tiree's unlikely part in the DDay landings. About the U-boat on next door Coll. But I have a beach to walk and a sea to surf* and an iron age fort to visit. Next time..
*this sounds way cooler than it is. I haven't managed to stand up yet. But today's a new day! Thanks for this -- enjoyed it. I've been to many of the isles but not Tiree. I shall suggest it for our next venture, I think. Sounds lovely, and I'm off to order your book!